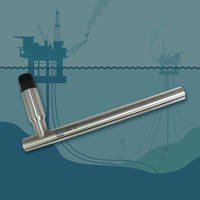 Subsea LVDT Linear Position Sensor has CiA 443 CANopen interface. With CiAÂ® 443 CANopen communication interface for use on subsea trees in offshore oil drilling, SSI Series provides feedback on valves in monitoring and controlling their status as part of subsea control module. Sensors are encased in Inconel 625 to withstand deep sea environments with pressures up to 5,000 psi. Levels ofÂ nickel, chromium, and molybdenum promote protection against corrosionÂ and meet service life requirements of at least 20 years even if fully exposed to seawater. Pennsauken, NJ – Macro Sensors now offers its SSI Series of Subsea LVDT Linear Position Sensors with the CiA® 443 CANopen communication interface mandated for use on subsea trees (a.k.a. christmas trees) used in offshore oil drilling. The term “christmas tree” refers to the assembly of valves, sensors and controllers and other equipment placed over a wellhead, which, in formation, resembles a decorated tree. Its function is to prevent oil or gas release from an oil well, while controlling flow rates to maintain steady production levels. Valves on the christmas tree are used to open and close oil pipes as they bring oil from the sea bed. The function of Macro Sensors Submersible LVDT is to provide feedback on valves in monitoring and controlling their status as part of a subsea control module. Failure to completely close a valve could result in an environmental disaster. In addition to complying with the new CiA 443 CANopen regulation, Macro Sensors encases its SSI Series of Subsea LVDTs in Inconel 625 to withstand deepsea enviroments with pressures up to 5000 psi. Due to a higher content of nickel, chromium and molybdenum, the Inconel offers excellent protection against corrosion and enhances the already high-reliability of the LVDT assembly, ensuring that it can meet service life requirements of at least 20 years, even if fully exposed to seawater. Reliability is critically important due to the cost of replacing subsea hardware. Macro Sensors’ extensive line of linear and rotary sensors are used for position measurement and feedback in a variety of industrial applications including factory automation, motion control systems, metal fabricating, automotive assembly as well as power plants, gas/steam turbines. Visit the website at www.macrosensors.com.